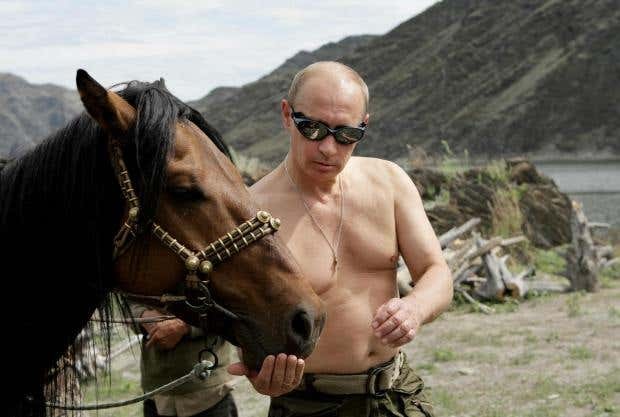 New interesting extension with images of Vladimir Putin with animals. It is generally known that Putin loves animals, especially dogs. Many politicians were aware of his affection towards animals and he regularly received such gifts from officials from different countries. It is also known that Putin is a huge fan of cats, not regular cats, but tigers and leopards, perhaps it is a symbol of power. People say he doesn’t smile, but you can see the biggest smile on his face when he’s with his family or playing with his dogs. The current president of Russia owns three dogs at the moment (Verni, Yume and Buffy), who live with him in Moscow. Verni was a birthday gift from the leader of Turmenistan during a meeting in Sochi. The puppy is an Alabai, a top Turkmen-bred variety of the Central Asia shepherd dog. ‘Verni’, means ‘Faithful’ or ‘Loyal’ in Russian. Yume, a 3-month old Akita puppy, arrived in Moscow from Tokyo, Japan in July 2012, as the Akita Prefecture’s gift to show gratitude for assistance from Russia after the 2011 Tōhoku earthquake and tsunami. Putin has been photographed with a variety of animal species – from polar bears to tigers and many in between. Once, the Russian president said: “I like animals, it seems I have a feeling for them. We liked each other” while cuddling a leopard in Sochi. We hope you enjoy this new tab and feel free to share with friends.